We are all more knowledgeable now about the music and life of Edmond Hall because of our session this week with the Adrian Cox Quartet presenting Profoundly Blue and what an evening it was too! 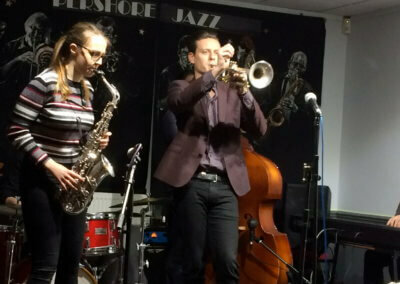 A highly polished performance from four definitely talented younger musicians from the jazz scene they gave a well rehearsed show as a tribute to this great clarinetist. Adrian played as Adrian always plays with passion and enthusiasm backed by Joe Webb on piano, Simon Read on Bass and Gethin Jones on drums all chosen by Adrian as his perfect rhythm section. Their new CD sold in numbers which says a lot about how much the large audience had enjoyed their evening. 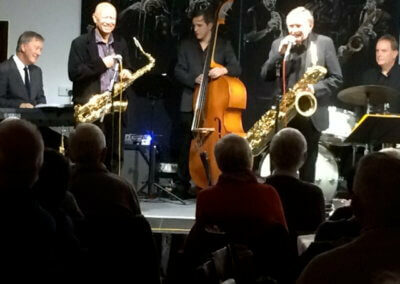 There was no better way to start our new jazz year that is for sure – thanks guys – you were superb. 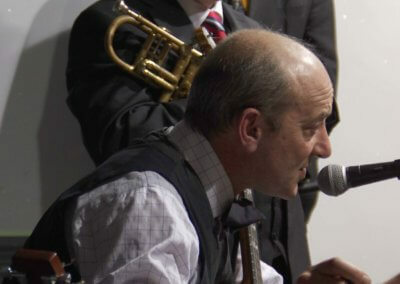 A quote from musician Jon Stone “what an amazingly brilliant professional performance from all four guys. That says it all beautifully ! !